If you want a wastewater-free cycle, our evaporation technology is your perfect choice. Our vacuum evaporators recover up to 98% reusable distillate, at such a high quality that you can either reintroduce it directly into your process cycle or lead it into the sewage system. 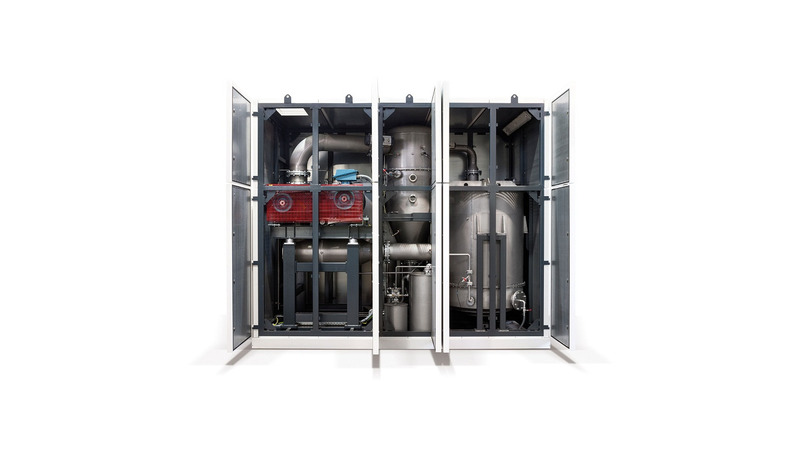 All our evaporators feature ultimate flexibility, reliability and process safety, they are easy to use, and designed for 24/7 operation all year round. The DESTIMAT® LE series comes with natural circulation. LE in the name stands for Low Energy. This set-up produces very low energy consumption and high-quality distillates, even with the most challenging types of wastewater. An innovative multi-stage separation system, called cyclone separator, delivers optimum wastewater cleaning results, while ensuring operational safety of the vacuum pump and the entire system. In an internal process heat is exchanged from the distillate to the incoming wastewater, increasing the system&apos;s energy efficiency even further. The system does not require any additional heaters or pumps, lowering energy consumption and operating costs. How much wastewater can be processed? The DESTIMAT® LE series features different models from 9,323 ft³ to over 812,237 ft³ wastewater per year.